This is the last Christmas Gift Guide in my series. 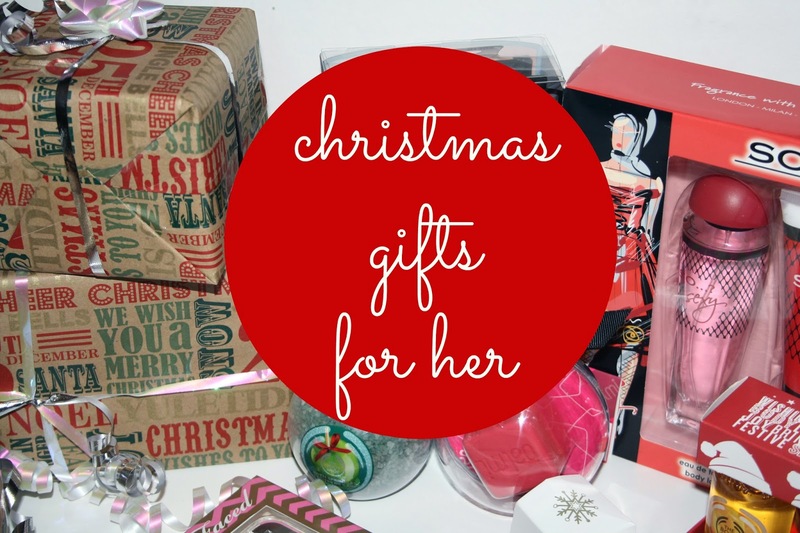 I've got loads of ideas when it comes to gifts for her, I always find buying gifts for my mom and sister really easy! First of all i've included these Sleep In Rollers, i've only used them once or twice, I will review them once i've used them properly. They are such a fab idea, I know so many people that would love a set and they retail at £19.50 which I think is really reasonable. They come in this lovely bag aswell which is great! Next this Mark Hill Big night out gift set, it comes in this really nice handy bag. Inside you get 4 full size products, curlers and a brush. The hair products themselves work out at about £24 so this is a great value for money, its such a lovely gift. The Body Shop Jingle Gels Sleigh, inside theres 4 different shower gels, its such a cute gift idea. It would be ideal for any friends and family. Everyone loves shower gels. This set retails at £8 so its really affordable aswell. The Two Faced Iphone Case palette is AMAZING! I picked it up in TKmaxx I think it was about a fiver. It's a palette and an iphone case. You just remove the palette from the case. It has some really lovely shades and it's such great quality. I haven't used any Two Faced products yet so i'm excited to give this ago. Real Techniques, The Core Collection. This is a must have in anyone's make up collection. Whats the point of spending silly money on make up if you don't have the right tools to apply it with. My mom always asks whats my secret to applying make up and I always tell her you need to use make up brushes. I think the Real Techniques brushes are amazing quality for the money! Balmi lip balm, I had to have this. I love the bauble! It such a great gift idea. Honestly i'd buy anything inside a bauble haha. This balm is a fiver. but its just so cute! It would be a great gift for someone who uses balms alot! A great gift for any secret santa! The so...? Gift sets are such great value for money, They are lovely scents and great gifts. My sister is a big fan of So...? fragrances! I think they are lovely for people who prefer sweet smelling scents. The Body Shop bath sprinkles again another bauble shaped product. I love these cute gifts, again The body shop is such a well know brand. Anyone would be happy to recieve a gift from The Body Shop for Christmas!